It is time to take a look at that old proverb “an apple a day keeps the doctor away.” When sayings stay around for as long as this one has, there might be some truth to it. Arrange the apple slices on a plate, in a circle fan. Sprinkle pomegranate seeds over and place raspberries in the center of the dish. Research shows that the soluble fiber in apples, called pectin, lowers LDL or “bad” cholesterol, aids in digestion health and can counter the negative effects of radiation therapy. For people who want to get rid of toxins in the body or just need to slow the absorption of food then apple pectin is for you. For people with type II diabetes, inflammation, gallstones or asthma problems there is good news. European studies have shown that eating two apples a day helped prevent and even promoted healing of those illnesses. Apples also support healthy skin and oral health. Apples have been found to help thwart tooth decay. The juices in apples have properties that kill up to 80 percent of bacteria found in the mouth. The phytonutrients in apples have been shown to reduce the risk of brain diseases such as Parkinsonism and Alzheimer’s. Researchers in France found that the flavonoid phlordzin, which is only found in apples, may help bone density and protect against osteoporosis. When it comes to cancer several research studies have shown that apples may lower the risk and protect against certain kinds of cancers. One study showed a 50 percent reduced risk of developing lung cancer when the study participants regularly consumed apples. Another study shows that eating one apple a day reduced breast cancer risk by 17 percent but eating two apples a day gave an even greater protection with a 39 percent reduced risk. It is important to eat the whole apple, skin and all. I would recommend eating organic or pesticide free apples if available, because research shows that eating the apple skins can reduce the risk of colon cancer by 43 percent and a 57 percent lower risk of liver cancer. Extensive research has been done at University of California and University of Wisconsin which shows that apples can prevent tumors and the spread of cancer thought the body. All the modern research has shown is, what ancient Greeks and Romans already knew, that apples have healing benefits. About 20 pounds of apples are consumed a year by Americans that boils down to about one apple per person a week. This means that we are not eating enough apples. Apples are wonderful and should be eaten at least once a day. Now for the bad news, eating apples with added sugar such as caramel apples may not be best idea. While the apple still has all of its nutrients the added fat and sugar could counter some of the benefits. These sweets may taste good and be ok for an occasional treat but a ripe apple is sweet enough. 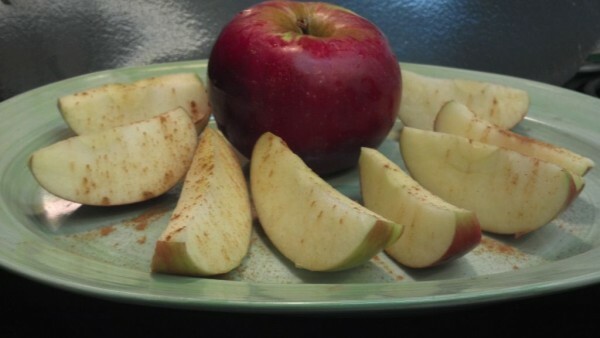 Personally, I love slicing apples and eating them with a sprinkle of cinnamon, which helps blood sugar remain level. Will eating an apple a day really keep the doctor away? Well maybe not by itself but when consumed with a healthy diet of a variety of fruits and vegetables then this fruit may just keep that doctor away. For more tips about living a balanced life, visit Summer Bear at www.summerbear.org.